I am not a big fan of oatmeal. I have always found it fairly bland. One time, at a restaurant, I wasn't feeling good so I ordered oatmeal. They brought me the creamiest, tastiest oatmeal I had ever had. Turns out, it was cooked in milk - what a big difference!! Recently I added oatmeal back into my morning routine. I only have it about once a week, on the weekends, but at least it's a step in the right direction. I always cook it with dried cranberries (the boiling milk rehydrates the cranberries while it cooks the oatmeal). 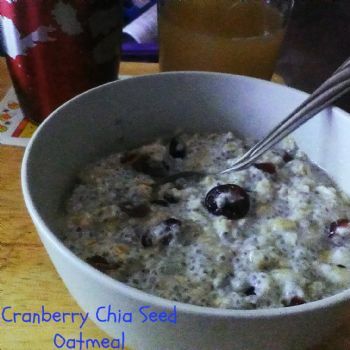 Last week I decided to shake things up a bit and toss in some chia seeds as well. Have you tried the steel cut oats? They are very nutty tasting. My favorite. I enjoy oatmeal. I always cook it in water. I'll try it in milk. I usually add raisins, but dried cranberries would be good too. I need to buy some chia seeds for added fiber. I just never think of it. Sounds good. I like oatmeal with raisins. Will have to try the milk and cranberries.